“It is not the strongest of the species that survives, nor the most intelligent, but the one most responsive to change”. The quote, which actually is not from Charles Darwin as often suggested, highlights a key point of our manuscript, which was published today in Nature Communications. In this manuscript, we describe how certain filamentous bacteria are able to generate cell wall-deficient cells when these bacteria are exposed to stressful conditions. Quite a paradox, given that the cell wall has been considered to be essential for the cells’ survival, and an important protection barrier to environmental stresses. Only under highly specialised conditions, invariably aimed at interrupting cell wall synthesis, can bacteria be forced in a cell wall-deficient state. Protoplasts are a typical example of such induced cell wall-deficient cells, created by enzymatic removal of the cell wall and which are routinely used in labs for generating genetically modified organisms. Another example are so-called L-forms, which are mutants able to proliferate without their cell wall. L-forms are created by exposing walled bacteria for extended periods of time to lysozyme and/or antibiotics targeting the enzymes involved in cell wall synthesis. Given the highly specialised conditions required to obtain such cell wall-deficient cells, their relevance in natural environments has so far been doubtful. S-cells of Kitasatospora viridifaciens stained with the DNA-staining dye Hoechst (blue) and the membrane-staining dye FM5-95 (red). In our paper, we present evidence that filamentous actinomycetes, which are ubiquitous in any soil environment, have the natural ability to form a new, cell wall-deficient cell type in response to hyperosmotic stress conditions, which we call S-cells. Using Kitasatospora viridifaciens as a model, we demonstrate that S-cells are extruded from hyphal tips and are able to switch to the canonical mycelial mode-of-growth. Remarkably, prolonged exposure of S-cells to hyperosmotic stress yielded variants that are able to proliferate without their cell wall in a manner that is morphologically similar to that observed for L-forms. However, instead of originating from prolonged exposure to antibiotic and/or lysozyme treatment, they originate from osmotically stressed cells. To our knowledge, this is the first clear evidence that the formation of wall-deficient cells and their transition into stable wall-less forms is a natural adaptation strategy solely caused by prolonged exposure to osmotic stress. 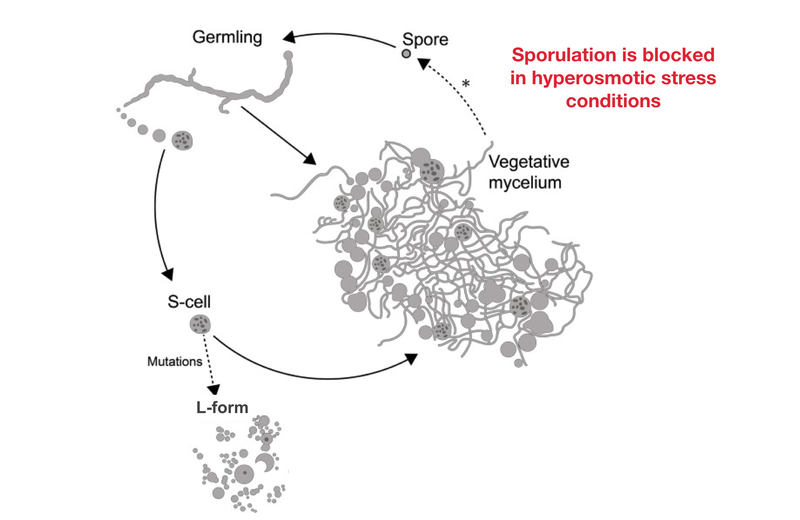 Given that S-cell formation is widespread in actinomycetes, our work strongly implies that shedding of the cell wall is a commonly-used strategy of these microorganisms in fluctuating environments. This work provides exciting new insights in the biology of these abundant soil bacteria, which may also have broad implications for our understanding of spreading of antimicrobial resistance genes. Given that actinomycetes are potent antibiotic producers, the extrusion of S-cells into the environment may play a major role in the dissemination of biosynthetic gene clusters and associated resistance determinants.